Silkheart Records presents the New American Jazz. by the musician Charles Gayle. Co-published by Silkheart Records & Ugly Duckling Presse. art by John d'Agostino, perfect-bound. Available from Ayler Records' website. 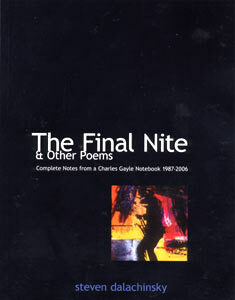 "Steve's poems do an amazing job of evoking the spirit that Charles Gayle draws from each time we hear him play. Each of these poems is a gem waiting to be grasped, held and considered. Each is fascinating in its own way, each an observation of life from a different perspective of another day or another gig." "Steve Dalachinsky writes free jazz. He lives the music, and his poems capture its heat and illumination." I have known Steve Dalachinsky for the past twenty years and for twenty years he has been dedicated to transforming his entire world into a poem. People on the street, visual images, social and emotional situations all become verse. Now of course this is one of the jobs of a poet but what makes this poetry sing is the honesty upon which it is approached. This goes way beyond free verse, epitaph, ode or haiku. It touches upon many styles as guided by the content. It is about the content and the reality that words are also sounds. Steve has been showing up to concerts of avant-garde jazz taking out pen and paper and proceeding to write words listening to all the great musicians of the time including saxophonist Charles Gayle who is the key inspiration for this volume of poems. The Final Nite is a poetic journal of living phrases, word-solos that will take on a different life for each person who reads them, against a background of the mind of each reader. This book takes you into a world of intimate feelings and reflec-tions. It is an echo of thoughts that runs through the psyche of spontaneous music and the second by second kinetic pulsations that Steve's creative antennas pick up. If we look at the other side of the coin this is also classic poetry sculpted out of a huge stone called vision. When you pick up this book to read enter at your own risk because there is no historical, logical or illogical net to catch your fall. Nor is there any radar to guide you through space if you choose to fly. This volume of spontaneous poems recalls one man's journey into the living word as reflected through sound. He uses the interval of the minor second giving one the illusion of reading words in-between words much like the idea of the microtone. If all the words in this book were put together they would make a sound very close to a Thelonius Monk piano solo. Dalachinsky writes musical sounds called words. They reverse the field and invert themselves forming their own logic. This poetry spins, dances, ascends, descends and eventually becomes part of the lining of our souls.